With his long thin beak and short fluffy body, he looked more like a character from a Dr. Seuss book than a bird you would find in downtown New York. But there he was, lying stunned outside of the Starbucks where the woman had been enjoying her coffee. “What is it?” she asked us when she brought him to the Wild Bird Fund for rehabilitation. 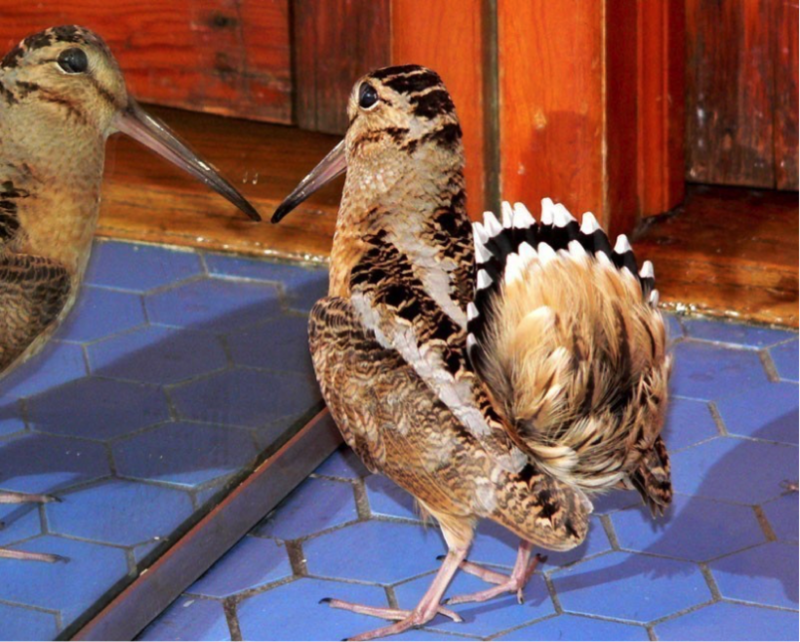 It was a Woodcock, and despite their exotic appearance, they are more common in New York than you might think – the city lies right along their ancient migratory path. 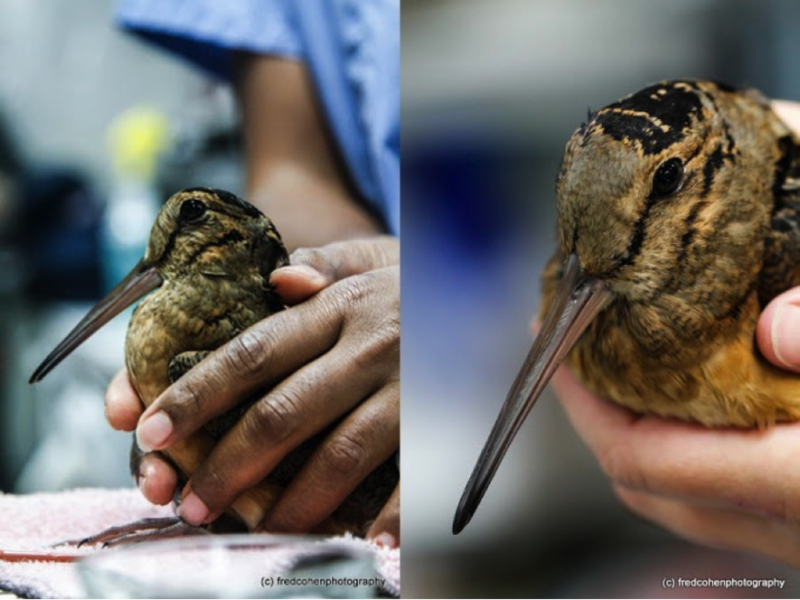 This past fall we have had over 50 of these little birds come into the Center with eye and beak injuries from collisions with glass windows. As well as at Starbucks, they have been found at Rockefeller Center, Roosevelt Island, Grand Central, Bryant Park, Macy’s Department Store and even in a revolving door at the Museum of Modern Art. Of course the birds much prefer the woods. The American Woodcock (Scolopax minor) is an expert at camouflage, and his feathers blend so seamlessly into a background of dried leaves that he defends himself from predators simply by standing still. Our patient had sustained a head and eye injury from his collision with the Starbucks window, so he was put on cage rest, given vitamin K to stop the bleeding and triple antibiotic ointment for his eye. Woodcocks can be difficult to rehabilitate. Two-thirds of them die from their injuries as soon as they are brought in, and the others stress easily as they are unaccustomed to human contact. They rarely eat on their own, so they must be tube fed six times a day just to maintain their weight. If they are too stressed, they even throw up that food, raising the risk of getting fluid in the lungs and contracting pneumonia. Our woodcock did fine. He had not sustained any long-term head injuries, and his eye healed right up. Because they leap straight in the air to avoid predators, we keep our Woodcocks in a separate room dotted with branches and boxes to hide in. Our patient spent his days wandering around freely, eating mealworms from a tray filled with soil, probing the earth with his long beak. Like all bird species, Woodcocks have distinct personalities, and they are well known for being anti-social – they show little interest in their surroundings – which makes for a great release. 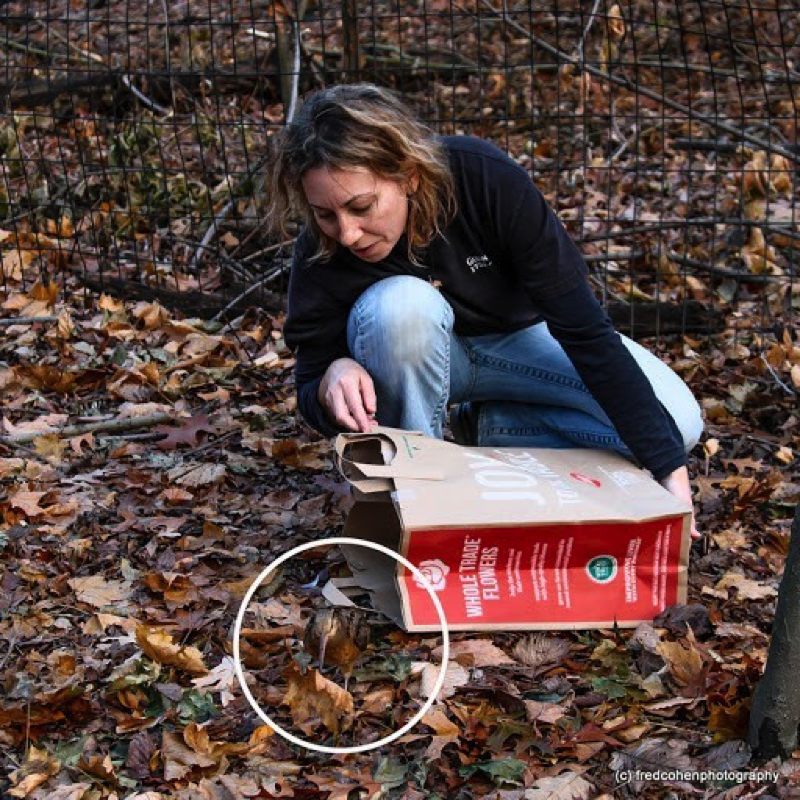 Once our patient was rehabilitated he was taken to a wooded area of Central Park and left to walk out of his brown paper bag on his own. 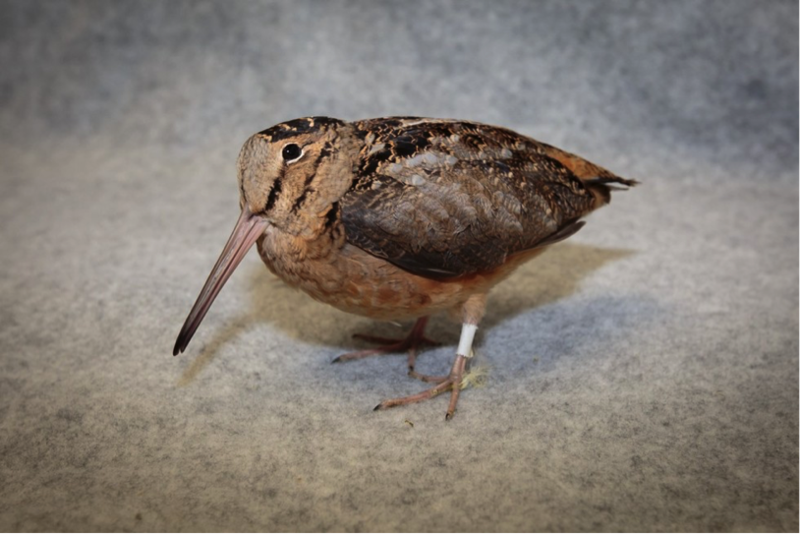 Most birds would take that opportunity to put as much distance between us as possible, but instead our little Woodcock just stepped forward casually, slowly bobbed his head and began hunting for food as if we were simply a colorful group of tall trees. As he wandered away, we watched as his outline slowly began to grow blurry until we could no longer distinguish his feathers from the leaves around him. Later, when we looked at the photos, we realized that his camouflage had almost completely fooled the camera. You’ll have to work a lot harder to see him wandering in the woods on your own, but we’ve added a circle to our photo to help you spot him below.